In yet another dramatic X Factor eviction, soul singer Paije Richardson got the chop during the dramatic results show yesterday, after an emotional sing off against Cheryl Cole’s cheeky protégée, Cher Lloyd. Sporting a brand new look and newly chopped locks, love or hate contestant Katie Waissel sailed through to the next round, along with comedy act Wagner – who sung and danced his way through not one, not two, but three ear-splitting Beatles songs during the Saturday show. But it wasn’t such good news for Cher and Paije, who – after coming in the bottom two – faced nerve-wracking standoff for the final place. Paije put in a note perfect performance of Sam Brown’s hit Stop, while Cher sung Shakespears Sister’s Stay, barely controlling her wobbling voice as the tears threatened to stream. 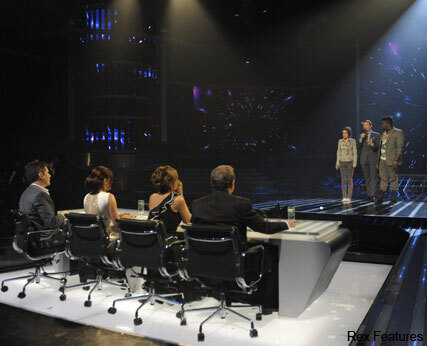 The final decision once again came down to Louis Walsh, who struggled to choose who to send home. In the end Louis chose Paije to get the boot, leaving a sobbing Cher to mouth ‘I’m so sorry,’ before being ushered off the stage. Last night’s shock eviction hasn’t gone down well with viewers, with many questioning the show’s integrity, and how a weaker contestant has survived for so long. And judge Dannii was also less than pleased, telling show host Dermot O’Leary it was ‘outrageous’ either of the pair were in the bottom two. What are your thoughts on yesterday’s eviction? Should Wagner have been given the boot? Let us know in the comments box below.